Earlier this month I told you about the standing stones at Nether Largie, one of the many prehistoric sites that are dotted around Kilmartin Glen in Argyll. Just a few hundred yards to the south, on the side of the busy road between Oban and Lochgilphead, is another enigmatic reminder of our ancient past. 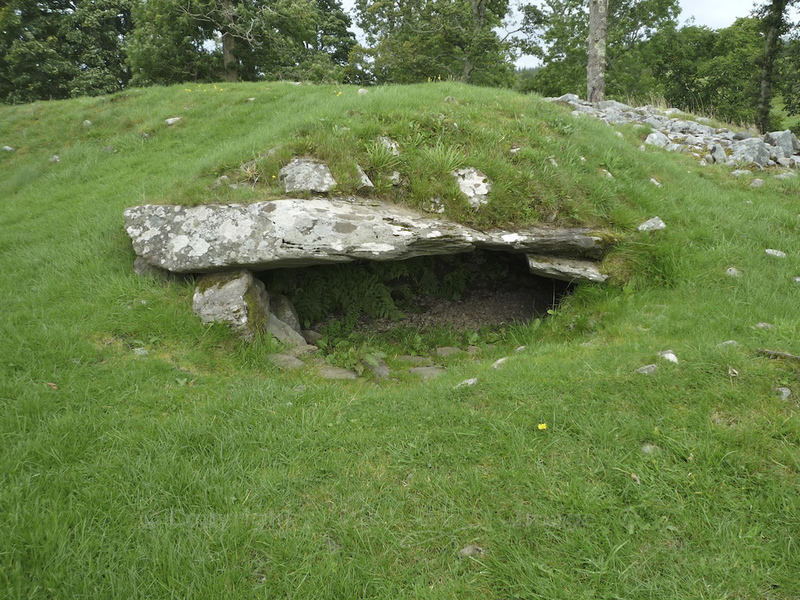 It’s called Dunchraigaig, and it is a cairn or burial chamber. 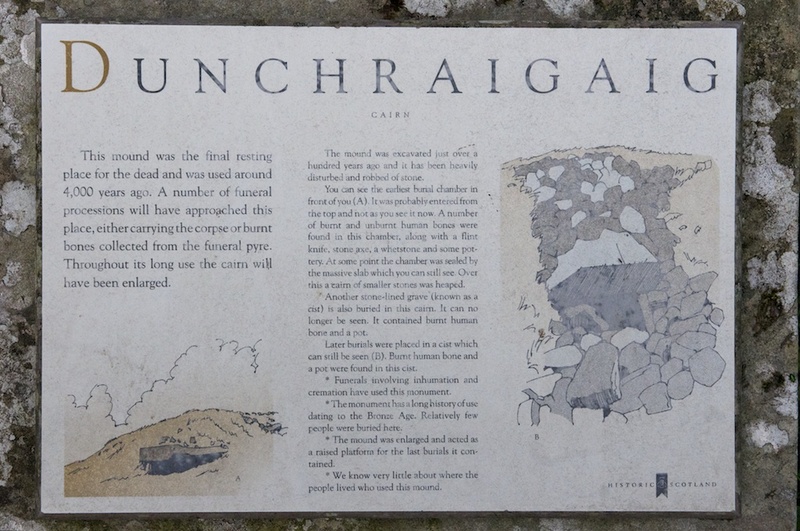 The meaning of ‘Dunchraigaig’ is still puzzling me a little: ‘dun’ often refers to a hill fort (in the same way as Dun Beag on Skye), and the ‘craig’ element derives from the Gaelic for ‘rock’. The suffix ‘aig’ I always thought meant ‘bay’ in Norse, but the sea is at least a mile away, and it can’t have risen much higher in the Bronze Age or else this area wouldn’t have been habitable at all. Kilmartin Glen is bristling with standing stones, burial chambers and cup-and-ring-marked rocks; most are thought to date from around 4,000 years ago. 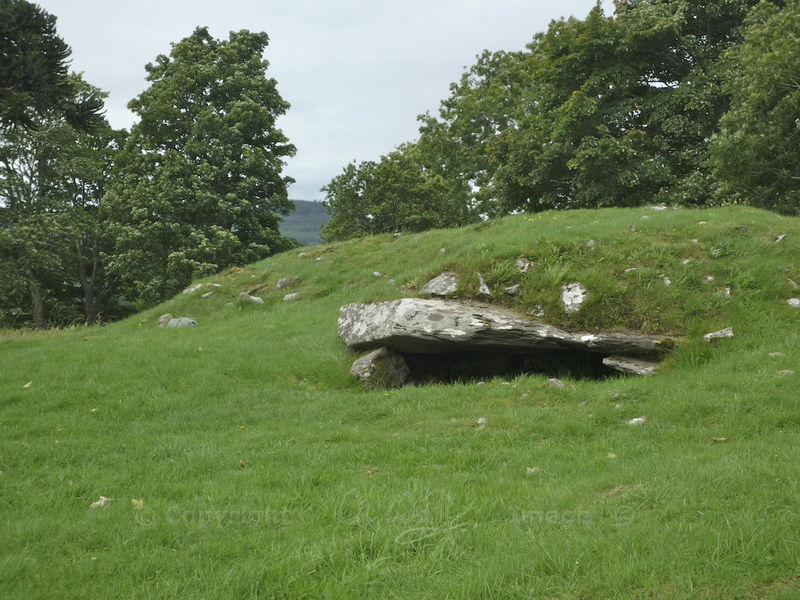 There are at least six burial chambers, five of which are aligned along the valley floor, with Dunchraigaig, the sixth, just to the south-east. Exactly why they were arranged in this way is a mystery that the Bronze Age people have taken with them to their graves. Dunchraigaig is one of those sites that demand a certain degree of imagination, because what you can see today is nothing like its original appearance. In fact, if you have someone with you who is inclined to dismiss historical sites as ‘heaps of stones’, do not show them Dunchraigaig! The setting of the grave is secluded rather than spectacular. Tall trees stand around it like silent guardians, and beyond them lies farmland dotted with low wooded hills. Just out of sight, to the west, are Loch Craignish and the Sound of Jura; a little further south, the River Add meanders through the ancient peaty marshes of Moine Mhor, ‘the great bog’, before flowing into the sea at Loch Crinan. This wild area is a haven for butterflies, dragonflies, hen harriers and curlews, and orchids thrive in the waterlogged soils. What you see on approaching Dunchraigaig is a low hummock roughly littered with stones, which makes it look as if an excavation is already in progress. 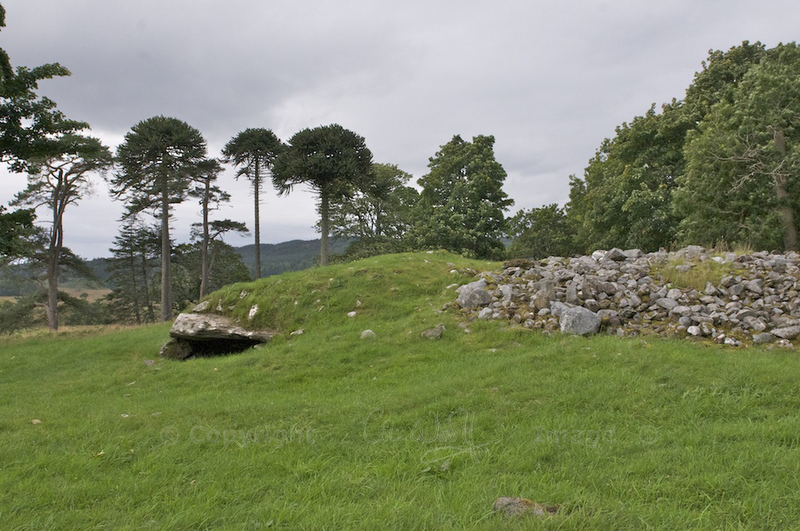 To the left, and jutting out of the side of the mound, is its most impressive feature, a large capstone resting on two smaller boulders and grassed over with turf. 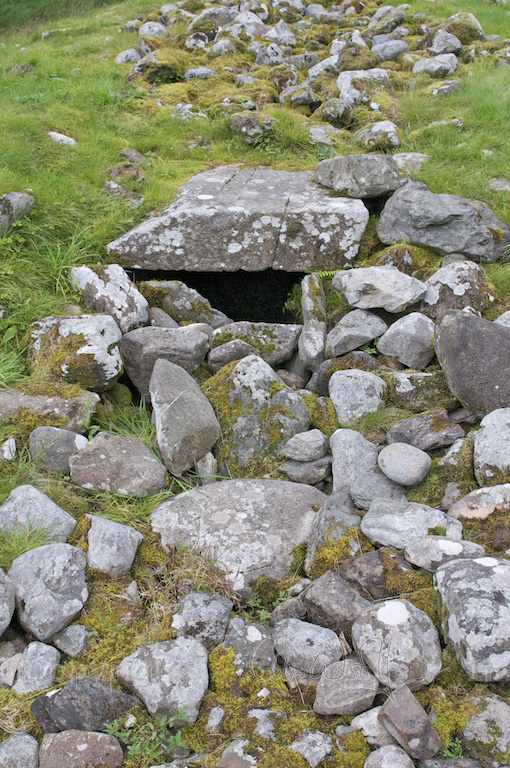 Beneath it is a hollow chamber which, at first glance, appears to lead right back into the heart of the cairn, but on close inspection you can see it is small and shallow. On top of the mound, roughly in the centre, is what looks like a second capstone, partly embedded in the ground. A small cavity hints at hidden depths, and around it is scattered a random collection of moss-covered rocks. So what has happened at Dunchraigaig, and how can we make sense of it? 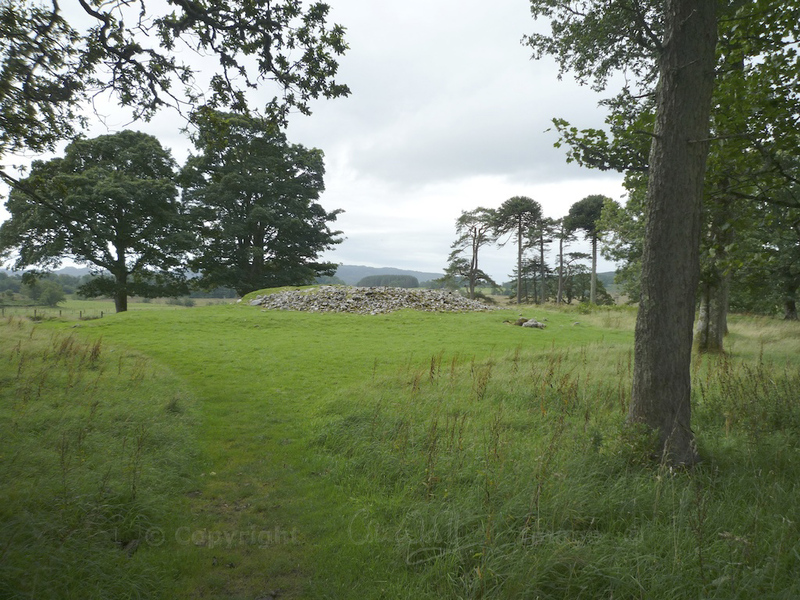 Historic Scotland suggests that the larger capstone was originally the ‘lid’ of the first burial on the site. Human remains were placed in a stone-lined grave which was then sealed with this slab, and a heap of smaller stones were placed on top. Access would have been gained from above, rather than the side as suggested by the stone’s present situation. Later, more graves were dug close by, perhaps over a period of centuries, and the mound was enlarged to accommodate its growing number of occupants. It is tempting to speculate on the common thread that tied them together: were they all from the same family, or perhaps generations of spiritual leaders? Unfortunately for Dunchraigaig, in 1864 it attracted the well-meaning interest of two gentlemen: one was a local minister, and the other was Canon William Greenwell of Durham Cathedral. Greenwell had a lifelong passion for ancient history. He had also excavated Grimes Graves in Norfolk, and some of his contemporaries feared that his enthusiasm exceeded his archaeological skill. Three burial cists or chambers were discovered, all of which revealed traces of cremated human bones. The one closest to the centre also contained a skeleton in a crouching position, and some reports claim that a body had been laid on top of the covering slab. 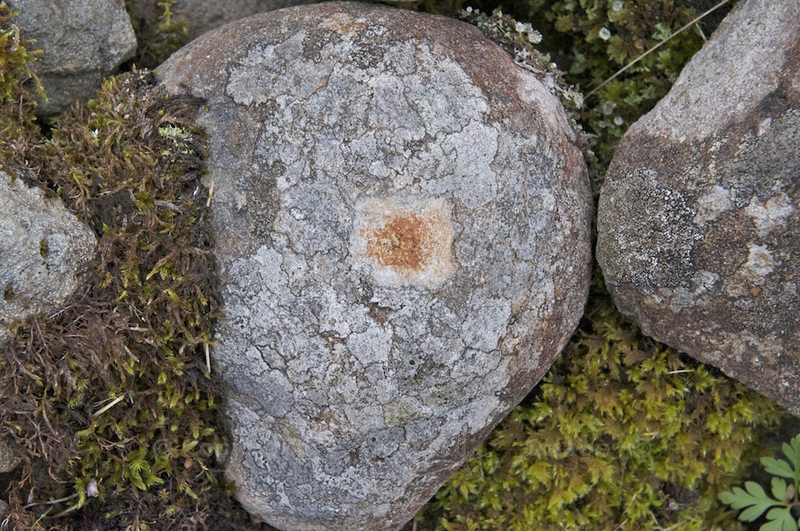 Under the larger capstone, however, were the remains of up to ten individual burials, and the stones of the cairn yielded artefacts such as a whetstone, an axe and a flint knife. The two Victorian archaeologists must have been delighted with these treasures, and it is likely that they took great care to preserve and record them. However, in the intervening period of 150 years, the large majority of their finds have somehow been lost. The only relics that remain are two food bowls, preserved in the National Museum of Scotland. I am sad for the people who were buried here: to lie in undisturbed peace for 4,000 years and then suffer such a rude awakening is not the fate I would have chosen for them. What made this beautiful glen so attractive to our ancestors? I think we’ll only ever glimpse the truth by looking at the pattern and arrangement of all the sites as a whole, rather than their individual features. The answer lies in the landscape, and it is probably something that we can only sense, with the remnants of a long-lost wisdom. Footnote: I have been asked by a reader in the US to suggest a pronunciation for ‘Dunchraigaig’. I’m not a Gaelic speaker but I would suggest ‘Dun-CHRAIG-aig’ with the stress on the second syllable and both ‘craig’ and ‘aig’ rhyming with ‘vague’. The ‘ch’ is soft, as in ‘loch’. If you are a Gaelic speaker and you are reading this, I’d appreciate your help! Kilmartin Glen is one of Scotland’s richest prehistoric landscapes. Read about the standing stones at Nether Largie, just up the road from Dunchraigaig, in this feature on The Hazel Tree. Thank you! Yes, it would be wonderful to roll back time and see what influenced Bronze Age people to place these structures where they did. The whole glen at Kilmartin is just fascinating – there is a good museum in the village (which I haven’t visited yet) which has a display of local finds. I have really mixed feelings about these prehistoric sites – the rational part of me would like to understand more, who built them, why, etc., but the intuitive – (I hate to say irrational) me, thinks that we’ll never know those answers as facts, only conjecture, and so I prefer to experience them as places of probably spiritual importance and just try to soak up the atmosphere in the area – for me that’s where their true beauty lies, because it can be a really magical experience to just sit and contemplate and enjoy whatever thoughts or ideas come to us. I also have an intuitive dislike of disturbing the graves – it simply feels wrong. You can tell I’m not one of the pile of stones brigade. I’m pretty much the same – while I like finding out as much as I can about the history (or prehistory), I love the feeling of these places, the atmosphere of them. I totally agree about not disturbing the graves, and I strongly believe that people should be left in peace. However, I think in Victorian times many archaeologists were just so overcome with enthusiasm that they were carried along by it. Glad to hear you’re not a subscriber to the Heap of Stones Society! Is it possible that this site may have been ‘named twice’ for its importance in a similar way to places such as Penhow (“hill hill”) in south Wales, meaning that on this occasion the ‘aig’ suffix is actually a partial repetition of the ‘craig’ element? That is a very good point! Like the River Avon, and various other examples I’ve forgotten! Or perhaps the ending of ‘aig’ makes the ‘craig’ into an adjective, i.e. ‘rocky’? Thank you for this suggestion! Yes, it’s a peaceful but rather puzzling place. That fifth image reminds me of a souterrain. Yes, I see what you mean – in fact, I wonder if this would have been described as a souterrain, if it had been found intact? Thanks for your comment, and for following The Hazel Tree! Fascinating post! It’s unfortunate that the early excavators ripped through the site leaving everything tumbled about. Thanks for posting this.—And for your American readers, can you provide a phonetic approximation of how this Gaelic place-name is pronounced? Thank you very much! 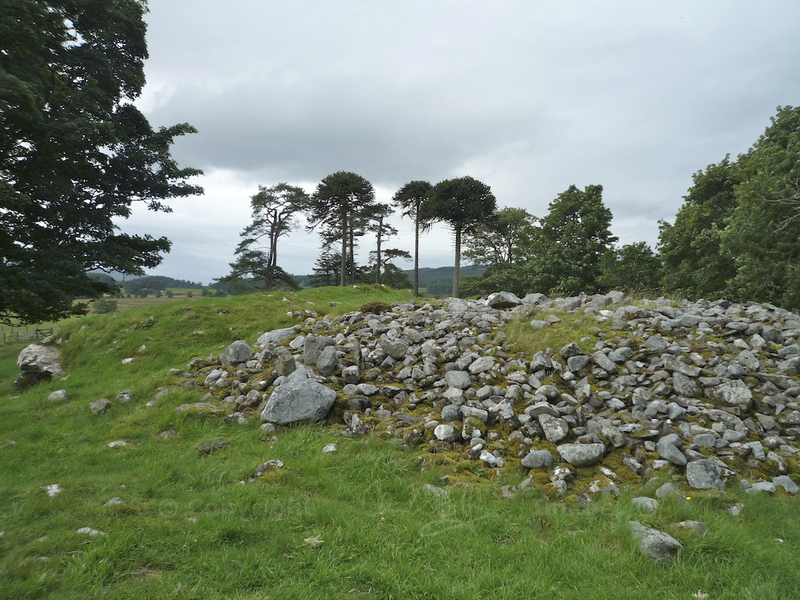 Yes, it is unfortunate about the misguided excavation – the Victorian era saw a sudden rise in interest with many landowners excavating sites on their estates, so Dunchraigaig is by no means alone here. You have a good point about the pronunciation! I am not a Gaelic speaker although I know some followers are. The best guide I can offer is: ‘dun-CHRAIG-aig’ with the ‘ch’ pronounced softly as in ‘loch’ and the emphasis on the second syllable. The last syllable is pronounced ‘ague’. It may even be ‘ay’ (as in ‘hay’), with the ‘g’ silent. I hope some Gaelic speaker reading this will put me right here! In Argyll, the usual pronounciation would be Dùn CRACH aig, with the emphasis on the middle syllable. Dùn (doon) is Gaelic usually meaning hill fort, and not just the hill. Crachaig is also the name of a rocky hill in the Isle of Jura near Craighouse where there’s a ruined hill fort, spelt in English as Crackaig. Gaelic crag/crac can mean a fissure. Isn’t it fascinating how place names always have a meaning, with a story to them. Thank you very much for that, Susan! I would love to learn Gaelic. Place names are endlessly fascinating. What an intriguing place, it does make you wonder what it would have been like 4000 years ago. I can well imagine the delight of the Victorian gentlemen who excavated it, but it’s a pity that so much of what they found has disappeared . I wonder if any of the finds might still be in the families of their descendants. That’s a good point, Lorna. I know that forgotten artefacts in private houses quite often surface when they are recognised by someone who is in the right place at the right time! Like you, I would love to have seen this place 4,000 years ago – and the rest of the glen, for that matter. You’re so right, Lynne, I never tire of it either! There are so many posts about Kilmartin just waiting to be written. Under our feet, beneath our footsteps, lie memories of our ancestors. Tread lightly. Well said, Ash. Thank you! As always, a wonderful article, Jo. Such an interesting and rich place, great pictures!. The linguistic aspect appeals to me and made me look deeper into the Celtic languages –fascinating!. Thank you very much, Carmen! I am always fascinated by the languages, too – I’d love to learn Gaelic, actually. No no, I don’t want my readers to weep!! 🙂 It sounds as if you really need to come over and see these places yourself! If I were to visit, I’d never return home. It’s just not in my budget to visit right now, unless I win the lottery. I did, however, stop weeping long enough to do a little research for myself with the meaning of Dunchraigaig. I have also heard of “dun” to mean fort. I found a Wikipedia article on Scottish Gaelic grammar (take it for what it’s worth) which states that “aig” means at. Not sure why it would come at the end of the word but taking the rest of what you know, fort and rock, I wondered if it could possibly mean fort among (rather than at) rocks. That is interesting – it’s always a possibility! Thank you for the suggestion. I think ‘fort among the rocks’ is a good description of the place. The ‘dun’ or ‘fort’ element may have come later, as most ‘duns’ seem to originate from the Iron Age. Chreagaig. Carn is where the word ‘cairn’ in English derives from and you’ll be able to see the word ‘creag’ in there too – still the word used today for stone, from which ‘craig’ comes.. There’s an unwritten rule in Gaelic that generally the emphasis is on the first syllable in the word (this can help when reading & pronouncing placenames, signs etc). ‘Aig’ does indeed meant ‘at’, but not in this context. Placenames are sometimes like a language unto themselves but in some cases names are derived from the oral tradition. So, names can sometimes relate to tales, stories, events, folklore. And, of course, mixtures of influences from different languages can have an impact, making them harder to decipher. Quite often the specific meaning of a name simply isn’t known. There’s an interesting ongoing research project on Gaelic placenames which you can see here: http://www.gaelicplacenames.org/databaseresult.php It’s by no means exhaustive, but really interesting to have a browse. A combination of archaeology and Gaelic is, without a doubt, one of my most favourite things..! Sorry to dig up such an old post, but would you know where I can find a map of this area with the various prehistoric sites marked? I found one on Google Images, but it’s too small to print and refer to as necessary. Try http://www.streetmap.co.uk and search for ‘Kilmartin’ in Argyll. This brings up the following: http://bit.ly/1lOXYNt You should be able to zoom in and out and most of the sites are marked. I cannot find a tailor-made map of the Kilmartin area with all the sites marked as well as this.